See the Legendary forums for monthly solo leagues! (1) I don't have the game in front of me to reference, so it's entirely possible I'll forget/confuse some details since it's been a week since I played. (2) We only played the first scenario in the game. I didn't get to look at the others to know how wildly different they are. (3) I'm not completely positive which rules are part of the overall game and what came from the scenario, but I think I've got it. (4) I think a proper review should have at least 3 plays in order to collect enough karma to purchase a character upgrade and try it out. But there's so little information out there right now that I want to help alleviate that. You are a group of Shadowrunners, mercenaries looking for work. Sometimes you get good jobs, sometimes not so good. But a job's a job and sometimes you only care about how much you get paid. More important than the job is your team. You're going to need all your talents just to make it out alive. Set in a cyberpunk future (around the 2060s) where magic has come back into the world and people find themselves transformed into elves, orks, dwarves and trolls, this is a strange and dangerous place. Shadowrun Crossfire is a cooperative deckbuilding game. This sounds familiar, but it plays quite a bit differently than what you're used to. Here, you are a team. A real team. None of that "I'll stay here and work on this, while you go over there and handle that other thing." Oh no, you have to cover your teammate's back before they get shot to pieces. No one wants to abort the run, so don't let it be your fault. Once you've chose a character race, you'll select a role or class. 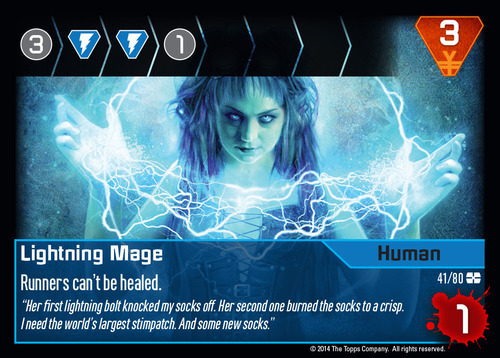 Each is associated with a damage type (a particular colored symbol), though you can add almost any card to your deck. Each role has a starting deck with 4 basic cards of their damage type and 1 of each of the other 3 types. Here's a summary. Street Samurai: Plays lots of weapons for combos and bonus damage. He can even pull enemies to him away from other runners to save them from a harsh beating and deliver one of his own. Deals Black (gun symbol) damage. Probably the simplest class to play. Face: The most social and interactive of the classes, the face tends to help out other runners and manipulates the market to his advantage. Deals Red (mask symbol) damage. Interesting cards and crucial to the group dynamic. Decker: Here's the guy who breaks the rules. Deckers can do all sorts of weird things, from disabling enemy abilities to generating off color damage. Deals Green (head symbol) damage. Once you've got your race, class, and starting deck, pick a scenario and you're on your way. By the way, this is the final updated card layout. The damage was moved to the top left (it runs down the left side of the card) and the cost is in the top right. The basic scenario is Crossfire. You were sent on a simple job, but you run into resistance on the way out. It's how these jobs tend to go. If it was easy, anyone could do it, right? The scenario gives you a backstory and establishes the parameters of the game; how many scenes, obstacles, etc., and the reward at the end. To go along with this, you have 4 different decks. The Black Market deck is what you'll be buying from. Six cards are dealt out to purchase from, and automatically filled in when you buy. Finally, you have the Crossfire Event deck. This ensures that the mission stays... interesting. It throws all sorts of twists and turns and complications in your way. A scenario is divided into multiple scenes. A scene ends once you've cleared all of the obstacles from the table and the fighting stops. When the scene ends, everyone heals 1HP and gets a turn to buy from the market. When you start a scene, you begin by flipping over the first obstacle. Each obstacle has a color that matches one of the runner damage types. Assign that obstacle to the runner with the same color and deal the rest out in clockwise order. Each runner will end up with one (if you're lucky) or more (if you're not) obstacles in front of them. Then you start playing rounds until the scene ends. The round starts with flipping over the top Crossfire Event card. (No example images of these online.) The card will have one or more symbols on them with effects. Text with an infinity symbol is in effect for the round. Text with a bomb next to it will happen when the event is discarded at the end of the round (if you haven't finished the scene). Text with a number in crosshairs will trigger only if the Crossfire level (the number of discarded events) is at least this number. - A live grenade just got tossed into the field and will go off at the end of the round. - Reinforcements have arrived! For the other guys. So what do you actually do? Each round starts with the runner with the highest HP. (Current or max, I'm not sure; we had a troll.) After flipping the round's event, they take the following steps. Play cards - The runner plays as many card from their hand as they want. You can play cards to deal damage to any obstacle, not just the ones in front of you. Put your cards next to your targets. If a teammate has a card with an Assist ability, they can play it on your turn to help you. Damage is dealt in levels based on the track at the top. If you can deal 3 damage (color doesn't matter), you can get in the first hit. Then you need to do a blue, then another blue damage, followed by one of any color. You have to do the damage in the order on the track. But it doesn't all have to be done on the same turn. There's a token to indicate how far you've gotten on the track. You're not taking this one down easily without a mage. And this guy? This is going to take some serious teamwork. Some cards say they do a level of damage. It doesn't matter what color it is, or how many colorless damage it takes, the card eliminates the whole level. So when you have a Lightning Bolt that deals 2 levels at once, or a Sniper Rifle that takes out the last 2 levels on an obstacle, you get really happy and feel like the most powerful member of the team. Take damage - If you still have any obstacles in front of you, they officially put the hurt on you now. Move your current health marker down the appropriate number of spaces indicated in the obstacle's blood splatter in the lower right. At 0 health, you're staggered. There's a good chunk of other rules about this, but you shuffle your hand and discard into your deck and don't redraw. You get 1 card at the start of your turn, leaving you unable to assist your team or plan ahead. "Staggered" seems an appropriate term. If you take more damage later, you go critical and your team needs to abort the run. (One person needs to survive the next round to get a minimal reward.) You can't be staggered and go critical on the same turn if you have multiple obstacles in front of you. It's worth noting that some obstacles will deal damage to multiple runners at once. You'll want to kill those guys first. Draw cards - If you have 3 or fewer cards in hand, draw 2. None of that "discard your hand and draw 5" stuff here. Your deck cycles slowly. Buy cards - Buy any number of cards from the revealed market, replacing the empty spots immediately. Any cards you buy go straight into your hand, which makes up for your undoubtedly small hand size at this point. Keep in mind that you only get Nuyen from defeating obstacles. You don't discard any cards for money or anything like that. After that, the next runner takes their turn and so on, until everyone has had a turn in the round. Then you flip the next event and start another round. Keep going until the scene is over. If you win, or at least make it out alive, you get some Karma (experience points) to spend on the upgrade stickers for your character. We got 3 Karma each for successfully completing the mission. The cheapest upgrades cost 5 Karma, and they go up in increments of 5 from there, all the way up to 50. As soon as I was done playing I wanted to play again. If you find the game to be interesting in the least, I think there's going to be a draw to want to play again in order to get those upgrades and personalize your character. They give you karma on that first mission almost as a tease to get you to come back for more. Well done. The thing that stands out the most is the way the team will cooperate. Helping your teammate by killing the guy who's about to kill him feels good. And you feel bad when you realize that you can't quite get there in time, so you focus your attacks on another obstacle instead. The team has to communicate and assess the threats to the group in a way that I don't normally see in co-op games. So how many players can you play with? Honestly, I don't know how you'd do this well without all 4 runners on the team. Sure you could probably diversify your decks (a Mage that also gets Face cards, while the Decker picks up Street Samurai cards), but some of the cards work against that. The game seems to work best when everyone has their own well-defined role. At the same time, though, having a few off color cards to get past some damage levels doesn't seem to be a horrible idea. Someone will try this out and give more feedback, I'm sure. It certainly shines with 4 players. It's worth pointing out that you don't keep your deck from mission to mission; it resets back to the starting configuration with each new game. There's no persistent deckbuilding here (unless there is an upgrade sticker that changes that) and that was my biggest shock/disappointment with the game. Your character only progresses via upgrade stickers and not through their deck (like Pathfinder does). There are, however, some upgrades that boost the power of your basic starting cards. They take a while to get to, but I suspect they're well worth it. The Crossfire level is a smart timing mechanism that amps up the intensity of the game as the fight drags on and you get stalled. If you slow down, it'll be harder to get out safely, and this does a great job of turning up the heat when you're already under pressure. Early cards won't trigger crossfire effects at the beginning of the game while you're still ramping up your deck, but later in the game, the safety protocols are disengaged. If you finish a scene, the active event is placed on the bottom of the deck, not discarded, so it doesn't add to the level for the next round. I think this was really well designed. The Black Market deck seems to lack depth. Each class only has 6 different cards for them in the deck. That doesn't sound like a lot. The distribution is weighted as well, so there are more copies of the cheap cards (that's good; you need cheap cards to buy early) and only a single copy of the 9-cost card for the class. But here's the thing: if there were a lot more variety in the deck, then you might run into a situation where you can buy, but there's nothing for your class. That would be really annoying and keeping the deck small helps prevent that. Also, and more importantly, the cards that are available are really good. I got really excited whenever I saw a Mage card come out. Words cannot express how happy I was to get a copy of Lightning Bolt. I never saw the Fireball (the mage's 9-cost card), but I was okay with that. The fact that you can't discard your cards for money is a bit confusing at first (because the basic cards have a cost of 1 Nuyen). This means you can be a bit strapped for cash at times, because you only get paid when you defeat an obstacle. This makes defeating obstacles really exciting; not only is there one less guy trying to kill you, but you get money to buy new tricks. Most classes are pretty consistent in how they behave. The Mage, though, can be a bit of a wild card. Stunbolt deals extra damage based on the cost of the top card of your deck. Deathtouch deals extra damage based on the number of spells in the top three cards of your deck. Not quite rolling dice for damage, but it can lead to exciting (or disappointing) moments. And on that note, I like how each class really feels distinct. Everyone adds something unique to the group. As exciting as the mage was, I wouldn't feel bad if someone else took that role and I had to try a different one next time. There are only a few missions in the box. I don't remember how many specifically, but I'd say it was only around 5. You can tweak various things to make them harder, but I'm not too worried. There's a lot of variance that can come from the obstacles and events. Also, I see this game as a starting point for user content creation. The missions are on separate, larger cards. I'm pretty sure we'll see the fan community start creating their own. And when they do, I'd offer up the following suggestion: make them bigger. Not bigger cards (although that's fine). Rather use multiple cards. Play out a scene, then branch the plot based on what happened during the scene (kind of like what Star Trek: Expeditions did). Is the Crossfire level above 3? You took too long, and have more obstacles in the next scene. Is someone staggered? Now you need to focus on finding healing in the next scene. I cannot wait to see what people start building for this. Speaking of the community, if you're worried about the stickers, I fully expect someone to redesign the stickers to print out on a standard label sheet, and redesign custom character cards to hold those labels. Have you noticed the art? It's really amazing. I love the art in the game. If you don't know much about the Shadowrun universe, it comes with a nice book (like the manual, not a paperback) that gives you a ton of backstory and info about the world. I flipped through it (around 20 pages or so?) and it looked really nice. Shadowrun differentiates itself from other deckbuilders not only through the highly cooperative nature of the game, but also changing up some of the staples of the genre. Buying cards straight into your hand, limited money for purchases, no trashing, and slow deck cycling all make this game feel fresh and unique in a sea of deckbuilding games. If you're not totally turned off by co-ops, deckbuilders, or the theme, this is a game well worth a look when it releases. Find a group of runners, find a job, and don't stop shooting until you get paid. And never make a deal with a dragon. I just wanted to confirm that the hand size printed on the character card only matters for the first turn? You said you draw 2 if you have 3 or less, and not back up to "hand size". The reason I'm curious is I'd like to try a Dwarf and they start with 2 cards. Also, with the "new" layout, in the blue card you posted does it do the 1 blue all the time, only when you play it, or only as an assist? I think the older layouts were a little more clear. We double checked the rules as we played and never saw anything that referenced a maximum hand size. Each role card has your symbol and starting deck contents on one side, and a turn summary on the other. It specifically mentions 3 or less in the summary, so that would apply to the dwarf as well. The starting hand size just seems to be an interesting piece to differentiate the races at the start. For the layout, Clairvoyance deals one blue damage if played on your turn and you draw and discard a card. If played as an assist, it still deals one blue damamge and the current player draws and discards a card. I think the new design does look better, but it did take a while to get used to it while playing. (And that's without seeing the old layout for comparison.) I think we're used to certain layouts and that's an odd place for such key info. But I'm not crazy about the centered icons on the old layout. Also, this helps declutter the bottom of the card. When it has damage, effect text, and an assist box, it would get pretty busy. Looking forward to this one ! Thanks for this review. It's probably the best explanation of the game I've yet to see. Very informative. I can buy cards from the black market without restriction ? For the most part, yes. Some of the cards have restrictions, particularly the mage cards, which say you can only buy them if you've played a Spell card this turn. (Like Lightning Bolt above.) That's a lot easier for the mage than anyone else. Also, with cards like Deathtouch or the Katana, you want to focus your deck in a particular direction. But even in the RPG, there's nothing stopping a mage from having good charisma (getting Face cards), or a decker from having a decent pistol skill as backup (getting some Roomsweepers). Is it possible to download the rules ? Not yet. Someone asked in another thread and was checking with the company, so we might see them soon. I tweeted them, and they said they're waiting on one or two things to fall into place, then the rules should be up. Great review, thanks for the write up. I am interested in this game, but would really like to see more in regards to character advancement/ persistence. Also, I am a lile skeptical of the replay value with only 5 scenarios included. For now I will put it on my watch list and see what others think about the long game, and also to see what the expansion model and rate is going to be. If you get one or two additional scenarios every 3-5 months, its probably going to be too slow to keep my interest. However, if there are 5 additional scenarios every month or two, and the character advancement turns out to be more intrguing than I am currently understanding, I am probably in. The LotR LCG only came with three scenarios and there was a fair tonne of replayability in there. To the OP, this really is an excellent review, thanks for taking the time to put it together. Getting excited for this game. Also, I am a lile skeptical of the replay value with only 5 scenarios included. I always find this concern odd, considering how many games don't have different scenarios at all. Does this ork look like Jesse Ventura to anyone else? Maybe Stone Cold Steve Austin? Nice write up! This game sounds like a lot of fun. How often does an enemy need to be killed by a certain color card? That seems like it would lead to some disappointment on enemy reveal as the mage finds out that only someone with black cards is going to possibly get the bonus for this one. Its a tough and addictive game. Never again will you play a game where you are so happy to survive aborting a mission. I don't know how often it happens, but there are options around it. First, everyone has one or more obstacles in front of them, and you don't have to attack your own. So maybe you can't finish the guy in front of you and get a bonus payout, but you can finish the guy in front of the Face and collect an extra nuyen there. Also, you start with one of each basic cards of the other 3 roles in your deck, so you're not shut out of any color. Finally, you've got other options like the Sniper Rifle or Lightning Bolt that deals whole levels of damage, which ignores any color restrictions.